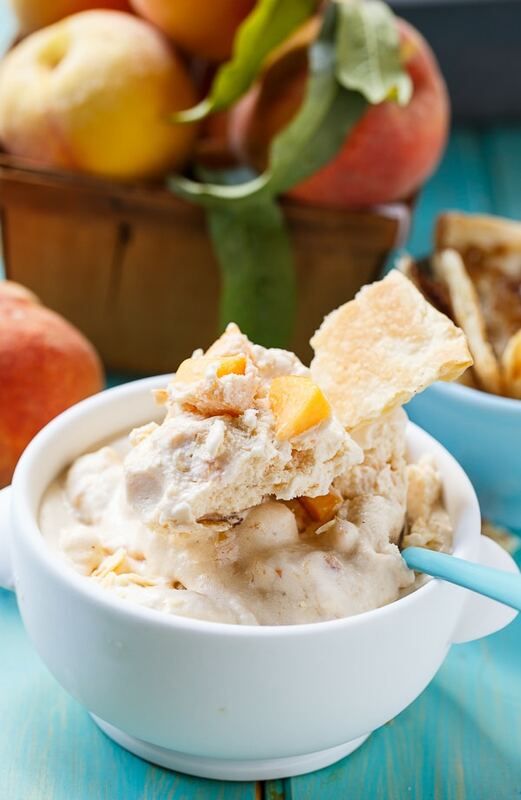 A creamy and rich ice cream with all the flavors of Peach Cobbler. This Peach Cobbler Ice Cream is a delicious summertime treat that is a perfect way to use fresh summer peaches. 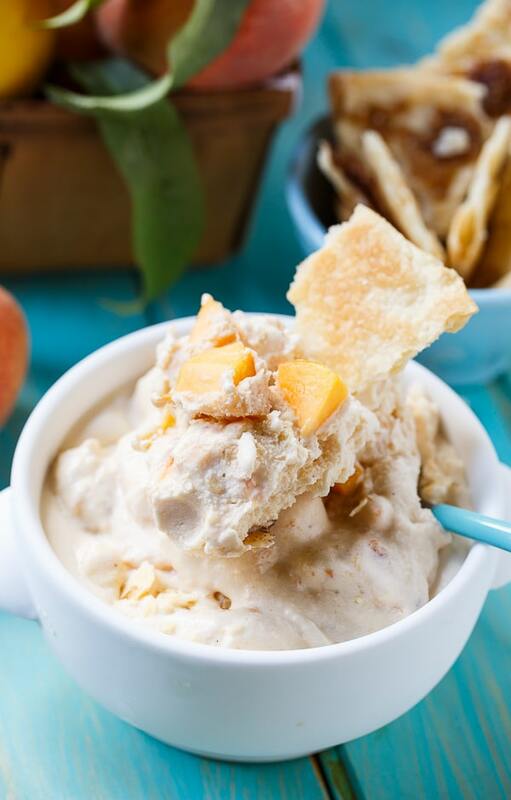 My favorite part of this Peach Cobbler Ice Cream is the pie crust pieces that are mixed in. The pie crust is sprinkled with brown sugar and cinnamon before it is baked and the little pieces in the ice cream not only give flavor, but also a nice texture contrast. You do need an ice cream maker for this recipe. I use the Cuisinart Ice Cream & Sorbet Maker . At about $50 , it is a really good investment if you love ice cream. I also use it to make my Banana Pudding Ice Cream. 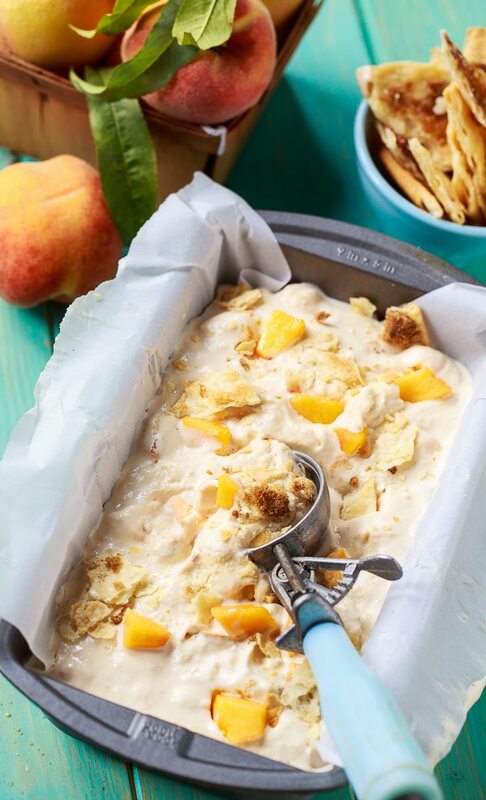 For an extra special treat, put some Peach Cobbler Ice Cream on some Peach Cobbler. Double Deliciousness! 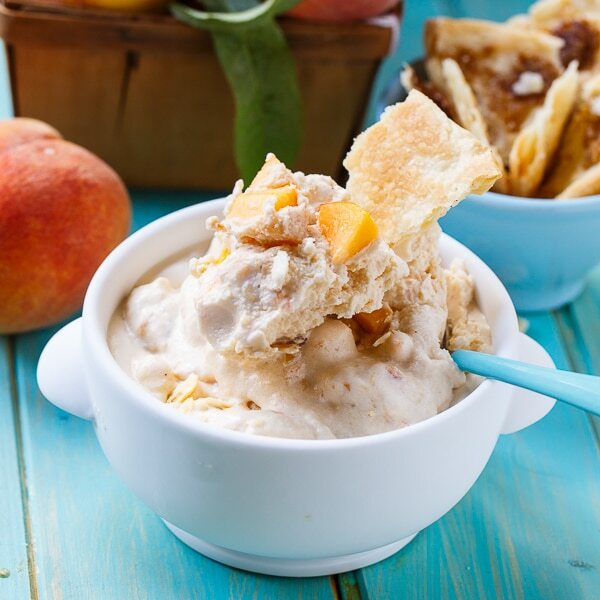 A creamy and rich ice cream with all the flavors of Peach Cobbler. 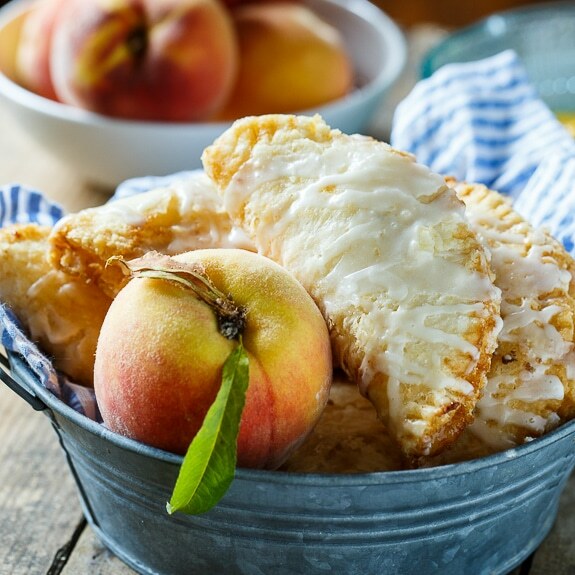 Fresh peaches and crumbled pie crust coated with cinnamon and brown sugar. Preheat oven to 400 degrees. Unroll pie crust on a baking sheet and drizzle with butter. Sprinkle with 1 tablespoon brown sugar and cinnamon. Bake for 10 minutes. Cut into strips and let cool. Take saucepan off heat. Place eggs in a medium bowl. While whisking, gradually (to not curdle the eggs) add about half the sugar/half-and-half mixture to the eggs. Take saucepan off heat and stir in vanilla extract and almond extract. Pour mixture through a fine-meshed sieve into a bowl and let cool to room temperature. Place 1 cup of peaches in food processor and process until smooth. Add processed peaches and chopped peaches to cream mixture. Pour into an ice cream maker and freeze according to manufacturers directions. Just before turning ice cream maker off, add about 1/2 the pie crust pieces, crumbling them into the ice cream. If ice cream is not thick enough for your liking, place in freezer for 1 hour. Serve with remaining pie crust pieces. This entry was posted in Desserts, Other Desserts and tagged ice cream, peaches, summer. Bookmark the permalink. I’m really sick of these people that post these recipes on Pintrest thinking they are another Paula Deen! Half the time they leave a step out (like this woman did) or they put the wrong measurement, etc. And you’re left with expensive wasted ingredients or a bad tasting recipe that you just throw out! Other than Christy Armabide ‘ s recipes I’m finished trusting these amatures! I followed the directions perfectly. At the end I still had the Cinnamon left to add. She left that part out! I added it when I added the vanilla’s. Big mistake! It made dark brown undesolved clumps in the mixture! I put it back on the heat thinking it would desolve but NO! I poured it through the sieve but they still came through back into the mixture! Then I tried pouring it through a paper towel. The paper towel was of such good quality nothing ran through it! Now I have wasted all of these ingredients and the flavor of the mixture isn’t that great. BEWARE! Sorry you didn’t like the recipe Susan. Even though you read the directions carefully, you must have missed the part in Step One where the cinnamon is added to the pie crust, NOT the ice cream mixture. Whoa you went over the top on this ice cream. Why bother with the rest of the meal! 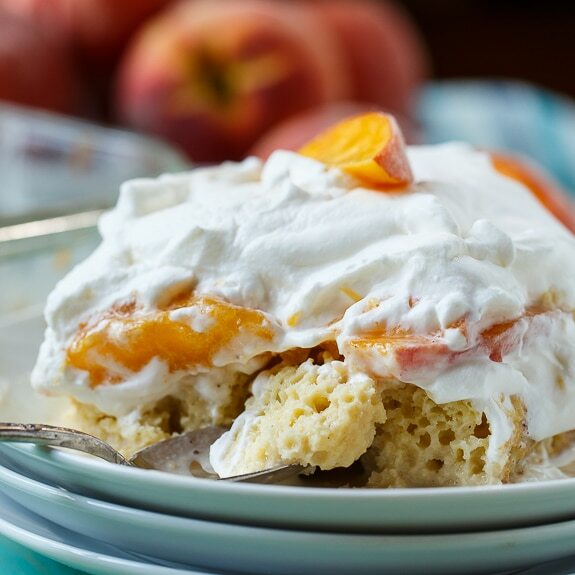 Refreshing—peaches in season—creamy—down right decadent in a non-chocolate way. This is the ice cream of my dreams! Adding the pie crust and chunky peach slices is such a great idea! I can’t get enough of peaches right now and love peach cobbler! This ice cream looks amazing, Christin! I always used to get peach ice cream from a local shop by me when I was younger, but I have a feel this is way better! Love this! OMG- Ice Cream Heaven!! 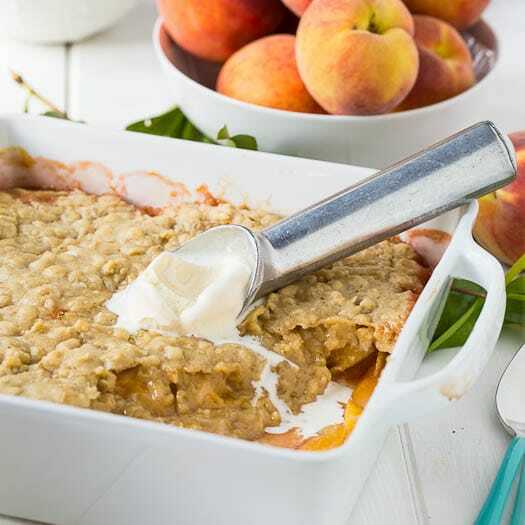 I love that you married peach cobbler with ice cream- such a genius combination! And the actual pie crust swirled into this ice cream sounds absolutely AMAZING! You are right, peaches are sooo yummy right now- this is a great way to showcase that juicy, succulent fruit! Cheers, my dear! I’ll take a double scoop of this ice cream! I love peach cobbler but this is even better! I’m loving all the peach stuff you’ve been having on here lately! I live for peach and tomato season. This looks so amazing!